This is a historical moment! Joey+Rory's Hymns That are Important to Us, an album of hymns and spiritual songs, debuted #1 on Billboard for Country Music and Christian Music. Listening to Joey Feek sing Take My Hand, Precious Lord draws chills through my spine, especially through her struggles with of terminal cancer. Every word is full of meaning and because it is all so real. Same with I Need Thee Every Hour. Whether you grew up singing these hymns at church, or your mother hummed them to you while putting you to bed, or they are all new to you, I promise you will be truly blessed by this collection. 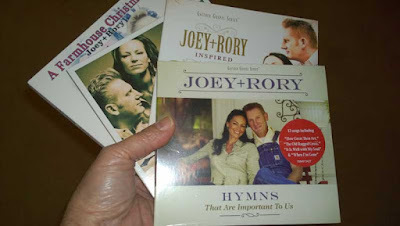 From The Old Rugged Cross to How Great Thou Art, Joey's dulcet voice stirs your soul and lifts your spirit. A few are not as familiar, like Suppertime, a sweet one that is especially meaningful to Joey who grows her own vegetables and enjoys calling her family to supper at the end of the day. Perhaps the most touching one is When I'm Gone, a song which tells of the first evening after a loved one's departure. Even though none of us want her to go, we are all reminded that no one is guaranteed tomorrow, so make each day the best it can be and love like it's your last breath. While a lot of the hymns are pensive and bluesy, her rendition of I'll Fly Away is upbeat and inspiring and the best version I've ever heard. Her faith shines through, touching and blessing all. She recorded the songs while going through chemo and radiation treatments, and she wants to leave us her voice as a blessing to all of us. While picking up Hymns, I also picked up their Inspired Album and was pleasantly surprised that my favorite hymn Are You Washed In the Blood is on it. I also came across this sweet interview of Joey and Rory way back. It's stinkin' cute! You have to view to the end when Rory screws up. Watch this amazing pair and go buy all their songs. You will be blessed. Promise.